The need for manageable and clean toilets within RVs is intense. Especially if you are headed towards remote locations where finding a restroom can be an issue. Additionally, having a toilet on board just makes the trip easier and prevents you from stopping multiple ties or even changing routes in times of need. RV toilets are designed to facilitate this convenience. They are often compact in order to be accommodated within the limited space in an RV. 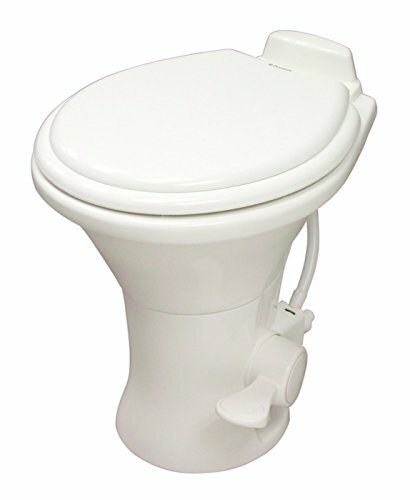 Is RV Toilet same as a Normal Home Toilet? RV toilets are different from traditional home toilets in a lot of aspects. In comparison to a household commode, an RV toilet’s water consumption is minimal. This is because RV toilet’s have limited tank capacity. They also do not have a flush tank as it may lead to spilling of water when the RV is on road. Additionally, they also do not have a flush tank lid because of the danger that it may break when the road gets rough. The RV toilets weigh only a fraction of what normal household toilets would weigh. They have flush valves that are not dependent on keeping water in a p-trap to prevent the infiltration of odor. RV toilets are therefore much more compact and concise to adhere with the space and functioning of an RV. What is a Marine Toilet in an RV? What is a Cassette Toilet and how does it Work? 1. Is it Important to have Toilets Installed in the RV? 2. Why can we not Install Normal Toilets in RVs? 3. 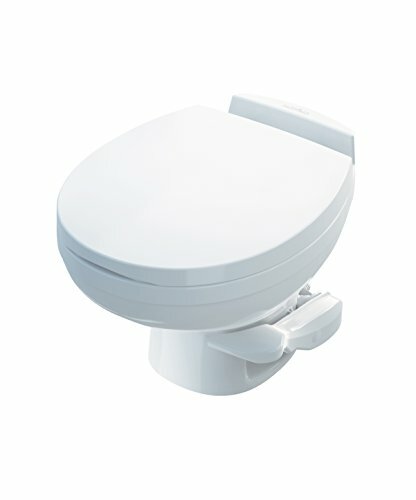 How do I Stop my RV Toilet from Leaking? 4. How can I Clean my RV Toilet? 5. How can I Avoid Bad Smell from the Toilet to Seep into the rest of my RV? 6. How much Water does an RV Toilet use per Flush? 7. How do RV Macerator Toilets Work? The key parameters to consider while buying the best RV toilets are space allocation, traveling period, the material of the toilet, type of flushing system, waste management, portability as well as durability of the material. The height of the toilet to ascertain comfort and the ease of installation are also important features. RVs are usually pressed for space, especial if you do not have one of those large ones. Thinking about space is extremely important when you are installing a toilet inside your RV. In case you have limited space inside your RV for the toilet, you can focus on three features that will be convenient for a limited space option. Cassette toilets with a 360-degree bowl to base location allow for limitless positioning options in limited spaces. Low space toilets that have a small footprint can be fitted in tight spaces, even on raised platforms. It also does not cause any compromise of comfort. Compact pedal flush toiled are also a lucrative option if you are struggling with space. Travel excursions in RVs often tend to get prolonged over a long period of time. Depending on where you are headed or what road you are taking, the opportunity for discharging your waste tank might be few at times. In such cases, you need to focus on additional considerations to ensure comfort and to avoid any problems which may arise as a result. Toilets with an additional waste tank might be beneficial in such circumstances. This increases waste capacity. The height of the toilet determines its comfort. The higher the toilet, the more comfortable it feels. Ideally, the height of an RV toilet should be the same as that of a toilet in your house. However, this might get affected by factors like space limitation. It is recommended that you focus on the dimensions of the toilet in comparison to the space that your RV allows for it. Sometimes RV bathrooms are compact and designed only to accommodate compact toilets. In any case, this is an important consideration before you make the purchase. The material that your toilet is made of determines its durability. Moreover, the material should also be able to handle the natural wear and tear of a normal toilet. It should also be easy to clean. A lot of RV toilets are designed to make this process easier. They allow for additional sanitation that prevents the accumulation of germs and bacteria in the toilet. These toilets might a bit expensive than the usual ones, but they are a worthwhile investment. Flushing mechanism is one of the most important features you need to determine before buying a toilet for your RV. The flushing mechanism should be effective so that you are not required to work towards cleanliness manually. There are different types of flushing mechanisms that are offered with RV toilet. Electric flushing models are gaining a lot of popularity these days. They allow for a remote electric switch or an electronic flush handle. Some flush mechanisms include a “full-tank-shut-down” option that cuts off power to the toilet to avoid overfilling the holding tank. Flushing mechanisms that create a circular vortex allows for a thorough cleaning of the toilet bowl and removes any dirt or debris. The valve at the bottom of the bowl should also function smoothly and effectively so that nothing is left behind after flushing. This additionally prevents the possibility of germ accumulation. On the road, you should not be spending too much time in getting the plumbing and water issues sorted for the toilet. The process should be easy, less time consuming, and convenient so that you can spend time enjoying the trip. Looking for toilets that are easy to install and are not fussy are generally recommended. It might help to see if the toilet comes with installation instructions. This will give you a good sense of how much work you will have to put in to install the toilet. Sanitary features: Sanitation is a big concern with RV toilets. The amount of sanitation that a toilet will facilitate must always be ascertained before you buy an RV toilet. There are some toilets that have an inbuilt anti-bacterial seat and bowl. They prevent bacteria and germs from collecting on the open surface. Additionally, some sanitary features also include a foot pump flushing. Foot pump flushing prevents the spread to germs that naturally happens with a hand flush, thus making the entire process more hygienic and clean. Having bad odor coming out from the toilet and seeping into the RV can be an extremely unpleasant experience. Understanding how the toilet bowl and flush helps in sealing away the waste will help in ascertaining the odor prevention capability of the toilet. The toilet you buy should allow for completely sealing away the waste tank from the bowl. A tighter and more efficient construction of the bowl, as well as the tank, prevent the spread of such odors. Efficiently constructed toilets are also secure of leakages and breaks while you are on the road. Leakages in the bowl, waste tank, as well as sewer hose should be checked for regularly to prevent the bad odor from spreading. There are two kinds of toilets, portable toilets, and composite toilets. Both of them have their own pros and cons but which one you go for depends entirely on your need. If you are someone who enjoys camping, portable toilets can be a good option. This is because these toilets can easily be taken out of the RV while camping. However, you will have to empty the waste if portable toilets yourself because they usually do not come with the RV septic system. This might be a bit inconvenient for some people. Installed toilets can be much more comfortable than portable toilets. They are also more convenient to clean. However, installing them might be a time consuming and sometimes difficult task. In order to make your RV experience worthwhile, some toilets come with additional features. These features may include a foot pump for flushing, space or hooks for keeping toilet papers, and hand sprays, among many others. While these features not only help in keeping the toilet and RV clean but also make the experience more comfortable and convenient. These features might come at an additional cost but they are well worth the investment. Marine toilets refer to toilets that were earlier installed on boats or ships. They are extremely compact in design and can be used beneficially in an RV. They come with a head and a holding tank that allows for easy management of sewage and also prevents odor infiltration. Marine toilets refer to toilets that were installed on boats or ships. They are also alternatively known as “heads” in the marine terminology. Marine toilets are also considered well suited for RVs because of their compact design. They are also designed to prevent any bad odor filtration through the cabins and collect the waste or sewage in a holding tank attached to them. The vessel has a head attached to it which is used to operate the flushing operation in the toilet. They usually have a hand pump to operate the head. A switch attached to the system allows you to pour water in the bowl after you are doing using it. On flipping the switch to the other side again the bowl is pumped out. The holding tank can then be emptied later when a proper place for disposal is found. There are now, however, more than one type of heads available that can be used in an RV. These include self-contained porta-potty, fixed plumbing system with a holding tank, and more complex systems that treat raw sewage before it can be emptied. The last option allows for sewage to be treated directly within the tank so that the possibility of odor infiltration is handled. A cassette toilet is a permanent toilet with a portable blank tank. They are one of the most popular toilet options with RV owners. A cassette toilet has three main components- the toilet itself, the holding black tank, and a water source. The toilet is permanently secured in the RV, preferably on the outer wall side of the driver’s seat. 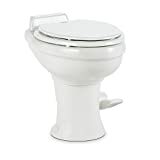 It has a handle attached on the outside of the toilet bowl that is used to open and close the valve of the holding tank. A flush button is installed on the wall of the toilet. The source of water is RV’s main tank which is attached to the toilet. It has a waste tank level indicator that warns you once the waste tank is full. The portable waste tank is put below the toilet. On pushing the flush button, all the contents are emptied into the waste tank. When the waste tank is full it can be manually emptied into a standard toilet or other waste disposable station. The tank is thereafter re-installed. If you are planning to travel a long distance and into remote areas, an RV toilet is a must. Not only is it convenient, but it also saves you from the trouble of re-routing when in need of a toilet. It also facilitates camping in fairly remote areas without the worry of having to track down a toilet. RV toilets are designed to fit into compact and limited spaces, unlike normal homes toilets that take up a lot of space and can be quite a heavy installment within the RV. you may also have to modify the plumbing system to accommodate a normal toilet in an RV. An RV toilet is easier to install and is more convenient for travel purposes. 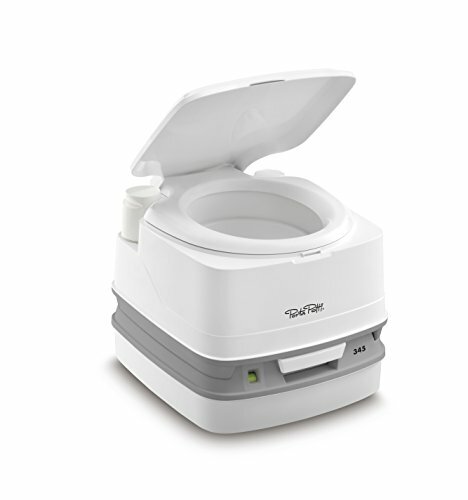 RV toilet bowls use a rubber seal to keep the water in the bowl. In case the rubber wears off due to usage or is damaged, it may give way to leakage. It is important to keep a regular check on the rubber seal to prevent any leakages. You can also use vaseline on top of the rubber seal to keep it supple and leak-proof. If you need to manually clean your RV toilet you can do so with the help of a disinfectant or bathroom cleaner, a sponge or brush, and rubber gloves. Put the disinfectant on the insides of your toilet and let it rest for a while before you rub it with a brush or sponge. Rince through with water in the end. There can be various reasons for the bad smell permeating inside the RV. Keeping the waste tank at some distance from the toilet will prevent bad smell inside the RV. Macerator toilet or vacuum toilets are a good option for this kind of positioning. If you have other kinds of a toilet, you can use sewage treatment in your tank. This will;l keep a check on the bad smell. An RV toilet uses two to three pints of water per flush. This is one-fourth the amount of water used by a traditional home flush. RV macerator toilets are like kitchen grinders that break down your waste into smaller particles that can be drained longer distances through a smaller hose. They use motor-powered blades to do this grinding before the waste enters the holding tank. Macerator toilets enable the positioning of the toilet and the waste holding tank to be kept at some distance. It also reduces the mounting of waste in the tank and helps in its easy and thorough disposal. It also assists in keeping your RV free of bad odor. Popular in the RV space, Thetford is a brand that you can trust for your portable toilets, tissue papers, refrigerators and so on. The company boasts to have guaranteed carefree traveling for over 45 years. It is not hard to see why this toilet is a bestseller in the category. 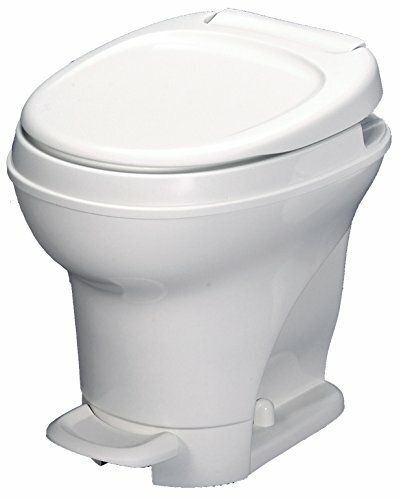 This classic-looking plastic toilet is lightweight, easy to install and very efficient. One of its selling points is the tall seating height, measuring up to 17 inches, which makes it super comfortable to sit on. 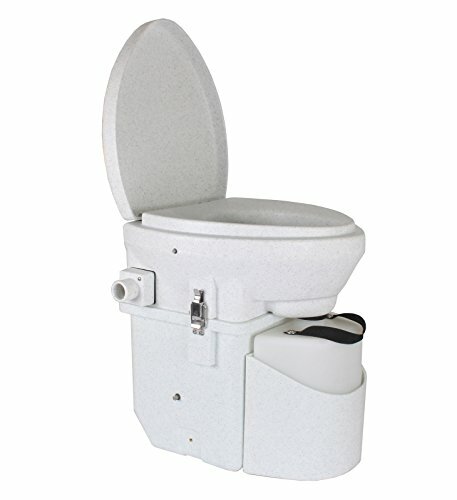 What customers will like the most about this RV toilet is its simplicity and ease of use. It features a one-pedal system that adds water when pressed halfway down and flushes completely on a full press, leaving no area of the bowl untouched. The textured lid helps shed off water while making the toilet scuff-resistant. Dometic is on a mission to make “mobile living” a lot easier. The company offers a wide range of useful products for adventure lovers and anyone who likes to explore the outdoors. This is a go-to choice for anyone who wants to enjoy the look, comfort, and feel of a full-size, residential-type toilet in their RV. It is made with sparkling vitreous ceramic materials that can last through the years. Its stand-out features include a wide elongated wood seat and a bowl which is deep enough to prevent your “privates” from touching the inside. 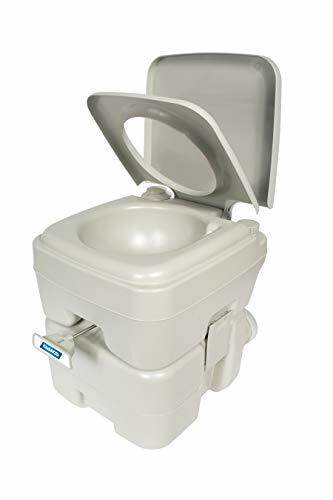 Other things to love about this RV toilet are the ease of installation (can be done within minutes) and ergonomic foot pedal system that allows for easy, hands-free flushing. On the upside, it comes with a spray faucet that you can use to spot clean as much as needed and a mount for wall attachment. Available in bone or white colors, Dometic 320 series RV toilet is very comfortable to sit on and requires little quantity of water to flush – a pint. Though comes at a higher price, this standard height toilet is a worthy buy if you consider the convenience and comfort it promises. It has a lightweight, plastic base and a full-size bowl, made of sturdy vitreous ceramic materials. 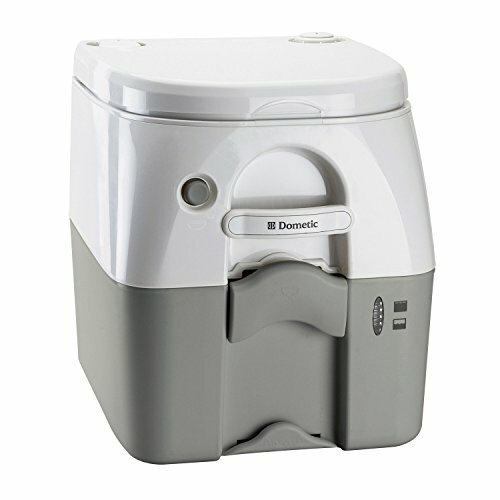 Dometic 310 toilet is easy on the eye, easy to clean and straightforward to install – takes a few minutes. The watertight flush ball system helps keep out bad odors, while the ergonomic foot pedal system provides a bowl-clearing flush with less quantity of water. One of the things people like the most about this toilet is the compact design, which makes it an ideal choice for RVers who have little space to spare. 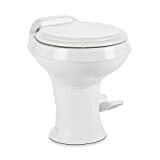 Also from Dometic, this toilet offers residential-style features at a very cheap price. It is constructed with polypropylene plastic material that is as durable as it is lightweight. 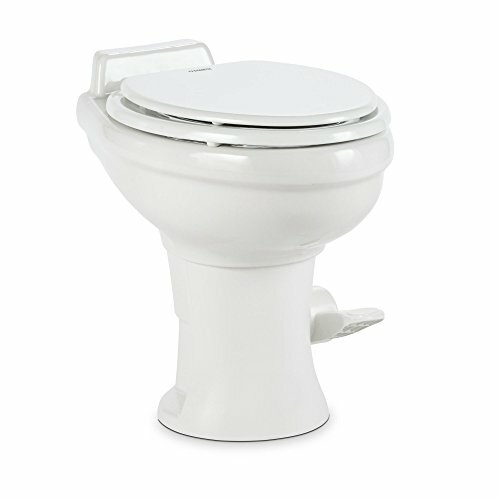 At 18 inches tall, this RV toilet boasts a high seating profile, which is ideal for most types of users. The foot pedal system, coupled with the triple jet action, helps deliver a powerful flush at all times while allowing you to control the amount of water needed per flush. One more thing people like about this gravity flush toilet is its simple and quick installation. It is bigger in size compared to most traditional toilets, making it a good option for people with a large build. This portable toilet makes the cut due to its stylish design, home-like comfort, and convenience. Much to the delight of do-it-yourselfers, it is very easy and simple to install. It is also good to know that the toilet is compatible with all types of RVs, regardless of the make or model. Another thing to appreciate about this toilet is its ability to prevent the growth of odor-causing bacteria and molds. As for functionality, it features a single pedal system which covers the entire bowl during flushing. Pressing the foot pedal halfway helps add water to the bowl while pressing it completely flushes down the “good little bits” efficiently. At 10.65 lbs., the toilet does not weigh down your RV, despite being a full-size model. Camco is a major provider of RV products that was set up more than 25 years ago. The company has its footprint in many South American countries, including Argentina, Chile, Bolivia, Peru, and more. The fact that many people prefer this type of toilet springs no surprise. First up, it comes with no black tank that most RVers dread emptying and produces no unpleasant odors. The unit is made using polypropylene plastic material, making it lightweight, portable, compact and durable. And it comes with a lid and seat for coverage. Boasting a 5.3 waste-holding capacity, this toilet is good enough for you and your family while on the road or in the camp. It is also good to know that it is kid-friendly – can even be used by children below six years of age. This modern-looking toilet is another great option for recreational vehicles. It is compact, durable, versatile, odorless and leak-proof. One of its coolest features is the exclusive rotating pour-out sprout which enables you to easily empty the contents. It also comes with a sealed valve that keeps the toilet smelling nice by ensuring that the odors do not leave the tank. Another good feature is the user-friendly indicator that you can use to find out if the tank is full or not. This portable toilet is easy to clean and use and comes with an ergonomic handle which makes easy work of transporting it from one place to the other. Based in Van Buren, Ohio, Nature’s Head is one of the leading producers of innovative RV products. The company has distributors all across the US as well as in Canada, Australia, and Europe. If you give a hoot about the sustainability of our dear planet, Nature’s Head self-contained toilet is an option you may want to look at. A natural, organic solution to your RV waste needs, this composting toilet is portable, versatile and rugged enough to withstand any type of harsh condition. The first thing buyers would like about this toilet is that it is self-contained, taking away the need for a black tank. It features a comfy, elongated seat and includes a hose and a fan which promotes air circulation, keeping your environment smelling great and cool. Contrary to what many people may think, this toilet is completely odor-free and installs in a couple of minutes. The unit also disassembles pretty quickly when it’s time to empty the contents. What is not to love about this sleek-styled, portable toilet from Dometic? It is attractive, easy to clean and rugged enough to withstand any kind of abuse. All thanks to its high-density polyethylene construction and attractive matte finish. This portable toilet’s most impressive feature is the touch-button flush system, setting it apart from its battery-operated competitors. Another cool thing about the toilet is the readable-level indicator, which allows for easy tank monitoring. It comes with a kid-friendly, full-size seat and a lid for comfort, coverage, and safety. 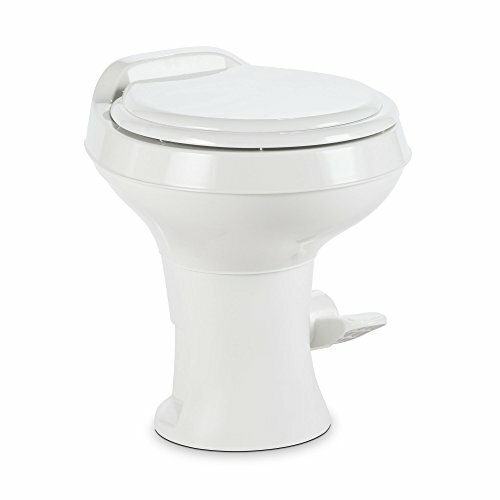 Its push-button technology ensures a hygienic and powerful flush with less mess and less pump action. Surprisingly, it takes up less space for a toilet with such a big holding tank. RV toilets are not same as usual toilets at our home and thus you need to be extra careful while buying them. There are so many choices available in the market today and thus it is important that you buy the right one. Which toilet have you installed in your RV? Share your experience with us!